When it comes to creating a world of their own, our children have got it down. It's been this was from the beginning. You remember those worlds, right? You huddle under a blanket and all the sudden you were in a rocket ship. Your basement could become an Egyptian tomb fraught with danger and filled with treasure. Here's the thing. Kids can actually create these places now! By punching trees and digging holes, they're able to work on their computer skills and take their imagination to a whole new level. It's no wonder that sooner or later, they're going to want to take the characters from online and bring them to life in the real world. That's what we call full circle! While this mask may look pretty box-like it is actually much more comfortable which makes it much better for a night of trick-or-treating. The pixelated face simply goes on with a band of elastic around the back. Making it easy for your child to take it on and off and hear you when you say "no more candy". Now, will your little Minecraft zombie will listen to you? We just can't say. 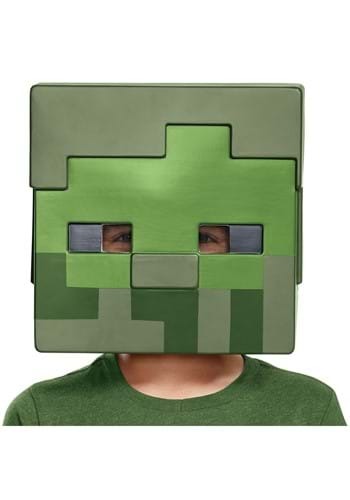 So if you're ready to bring your child's passion for creating in Minecraft into the real world this Halloween, this Zombie Minecraft mask is the way to go! Your kiddo can even pair up with Steve, Alex, and a Creeper to make it a group costume. Just like in the Minecraft universe, the sky is the limit!